Favorite Vlog: Matt Merrick and "What It Takes to Be a YA Galaxy Defender?" Thanks to this blog and my involvement in the book-lovers community I have met some absolutely fabulous, supportive, kind, lovely people. I love all of you guys, seriously! Some of you have become close friends of mine. You come back to comment on my posts, you stalk me on Twitter and Goodreads, you're my book soulmates and more! And now onto the giveaway! - 3 winners will each get their choice of one book from the list above. - You have to be 13 yo or older to be eligible to win. - You have to be a follower of this blog and enter through Rafflecopter below. - There are many to get extra entries so knock yourself out! Thanks for hosting this awesome giveaway and congrats on your blogoversary!! I would love to win the Last Princess or Glimpse!! The Last Princess for me! Id love to read This Is Not A Test! Thanks for the amazing giveaway and all the best for year 2! Happy Blogoversary Evie! Wishing you many, many more. Thanks for hosting this awesome giveaway. I'd love to win Something Like Normal. I'd love to read the Immortal Rules! And congratulations! I am thinking on this one...it's a tie between Immortal Rules, Breathe, and Until I Die - but all of them look/sound interesting!! Congrats on 1 year, you've done a lot in such a short amount of time. I'm thinking I'd like Beta but choosing just one book is (as always!) hard! Congrats on your one year!! That's so awesome! I would choose Revive or Until I Die.. both sound really good! I would pick The Immortal Rules. That's an amazing set of accomplishments for one year. Congrats!! I'd love to win Goddess Interrupted! I love Courtney Summers and I can't wait to read This is Not a Test. Thanks and happy blogoversary! I would like to win Goddess Interrupted! Thanks for the chance to win and congratulations! I would love to win the last princess! Happy Blog-O-Versary! Congratulations! You have done great on your first year, so many followers and reviews! Happy Blog Birthday! Congratulations on all you have accomplished :) I'm a huge fan of the 2012 TBR challenge! Either the Immortal Rules or Until I Die. Thanks for the giveaway & Happy Blogoversary!!! Congrats on one full year! I'd love to win either The Immortal Rules or Glimpse. Thanks for hosting this giveaway! Great Giveaway and Happy Blog-O-Versary! I'd love to win The Immortal Rules! I'd like BETA or This is Not a Test. I can't decide! Ohh, such a hard thing to decide!!! Maybe Breathe or This is Not a Test. Hope you have a great blogoversary! I LOVE YOU TOO!!! Congrats on your one year Blog-O-Versary!!! I'm between This is Not a Test and Something Like Normal. I am fairly sure I would choose Until I Die. Thank you so much for doing this!!! Congrats one the milestone!! I only hope that I can make it as far as you did!! I'd like to win either The Immortal Rules of Until I Die. I'd love to win... hm... Glimpse, probably. Congratulations on one year Evie! :) You've done an awesome job in one year, I can't wait to see what you do in the second year. Just seeing how you interact with others in the community, you're such a positive force within the community. :) Can't wait to see where you and your blog go next. I'm not entering the giveaway, just wanted to share my thoughts and say congratulations. You are such an awesome person, it's really an honor to know you. I am sure other people that have met you through blogging, at events and things like that would all feel the same. You just got an amazing personality, and are a great part of this community. I'd like to win Until I Die. A very HUGE happy blogoversary to you, Evie! I'm going to leave the prizes up to your loyal followers, but wanted to come by to give you a big virtual high five, so: *HIGH 5*. Very difficult choice, but I think I would go with Beta by Rachel Cohn. Happy blogoversary & thanks for the giveaway! I'mnot sure what I'd want to win, Beta or Survive maybe. I would love to win This is Not a Test!! Thanks for doing this blogoversary!! Congrats on the blogiversary! And I would ask for Stormdancer. I can't wait for that book! Happy Blogoversary! Here's to many more to come! Thanks for the giveaway, I'd really like to win The Last Princess. The waiting sky looks good! I'd like to win This Is Not A Test, it's different from what I usually read ! Happy Blogoversary ! One whole year congrats. A VERY happy 1 year anniversary to you! I just joined your site. Friends on Twitter and Facebook. etc. Happy bloggoversary! I would love Breathe! Congrats on your 1 year blogoversary! I'd like to win Beta by Rachel Cohn. I would pick Breathe by Sarah Crossan. I would love UNTIL I DIE. I'd pick This is Not a Test! I would love to win Until I Die. Thanks so much for the giveaway! All of them? I honestly don't know, but if I win I will figure it out. Promise! Thanks so much for the giveaway and Happy Bolgoversary! I very want to win 'Revived' by Cat Patrick. It is honestly so incredibly hard to choose! So many great books in that list! But I would have to choose The Immortal Rules. Happy first year blogoversary! I wish you all the luck in the future!! A big Happy Anniversary and congratulations. You've given us some amazing books to pick from and it's so hard to select so I'm going to go with my fave eye candy and the cover I like the best. Beta. My choice would be Beta or Breathe - both sound really interesting to me. Congratulations! Either The Immortal Rules or Stormdance I think! Happy blogversary and congratulations for this amazing blog!!!! And thank you for this great giveaway with such beatifull books. I'd like to win Revived or Survive. Thanks for the giveaway. I chose This Is Not a Test and am keeping my fingers crossed! Wow! I came hear only a month ago and never thought your blog was so young. Congratulations! thanks for the giveaway and congrats! I would love to win the immortal rules! 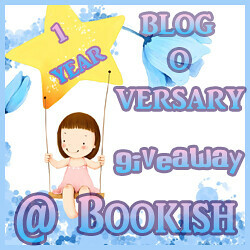 Thanks for the awesome giveaway and congratulations for your blogging anniversary =). I would love to win Something Like Normal by Trish Doller. Not sure which book I would pick,maybe Revived or The Waiting Sky. I'd love to win Goddess Interrupted or The Immortal Rules. They both sound like really good books! I would definitely choose The Immortal Rules! I'm a new follower and thank you very much for this giveaway and the fact that you've made it international!! The cover of Revived is so intriguing... and I want Until I Die, too! by Claire Merle ´cause this book sounds great! The Last Princess sounds amazing!! Congratulations! I´d like to win Breathe. Beta or This Is Not A Test - both sound really good. Happy blogoversary!! I'd love to read The Last Princess! :D Thanks! Congratulations and thank's for the giveaway! I'd go for Goddess Interrupted if I was lucky enough to win! Congratulations on 1 year! And thanks a lot for hosting this great giveaway. If I were lucky enough to win, I think I would choose Breathe, but there are a lot of awesome choices there. Thanks again Evie! Congrats on the 1 year!!! And thank you for the giveaway! So many great choices...I think I choose Goddess Interrupted. I would pick Counting Backwards! Happy Blogoversary Evie!! You have such a great blog and I enjoy stopping by and stalking it!! I am honored that you put me as one of your biggest supporters. :) You totally rock chick!! Love ya! If I won I would choose This Is Not A Test. If I could win 1 book, it would be Stormdacer by Jay Kristoff. I would love to win The Immortal Rules. You chose some really aweomse books! Thanks for the giveaway! Happy Blogversary! And thanks for such an awesome giveaway! Congrats on your one year!! That was amazing!! I would love to win The Last Princess or Goddess Interrupted. Thanks for giveaway and chance to win!! I'm torn between Breathe and Immortal Rules both sound awesome. I would love to win Survive or The Glimpse. Happy Blogoversary, I'd love to win a copy of The Immortal Rules. I would love to win The Immortal Rules by Julie Kagawa, this book looks fantastic! I'd <3 to win Until I die by Amy Plum! Thank you for this very generous giveaway chance! Aah, I can't choose! But if I win, it'll be between The Immortal Rules or Stormdancer! Congrats on the Blog-o-versary and thank you for the giveaway! Congrats! I'm not sure, probably The Immortal Rules or Revived! Happy Blogoversary!, hmmm I think I would go with Survive by Alex Morel. Thanks for the generous contest. All the books sound good. I think I would pick Goddess Interrupted. Happy Blogoversary!! :) Such a fun anniversary to celebrate. congrats on your 1 year!! i like to win something like normal. Serious congrats on the success of your first year! Thank you for this giveaway, you can really pick amazing books! My choice would be either Ashes of Twilight or Stormdancer. Happy Blog Anniversary! I would like to read The Waiting Sky. Today's the first time I heard about and the premise caught my attention. By the way, HAPPY BLOGOVERSARY! They all look very interesting hard to pick just one. I would definitely want Until I Die! Die for me was an amazing book! I would pick The Last Princess!! The book I choose is This Is Not A Test. Maybe Goddess Interrupted? I can't decide! I would love to win This is Not a Test!! I would love to read Breathe! Happy Blogoversary!!!! Congrats! One year is so exciting! Love the cover for Survive. I'd love to read The Immortal Rules! So many choices! I've got my eye on Counting Backwards, but I'd definitely also like to read Stormdancer, The Glimpse and The Last Princess too. So hard to pick just one! You've done a lot in that 1 year :) Thank you for being a great blogger and sharing your love of books with your followers. I'd probably go for The Immortal Rules or Revived. Congrats Sweetie! That is a big accomplishment to make it to one year, let alone everything you did. Your little blog is awesome and you are wonderful! I am glad I meet you :) I would be happy to win any book. I'd like This Is Not A Test! glass @ I'm a redaer, what about you? The Immortal Rules sounds just about amazing. Wow so many great choices but I would go with Until I Die. I absolutely loved the first book and can't wait to get back into the world of revenants. Oh I have missed Vincent lol. I'd like to win "Goddess Interrupted". Congrats on your blogoversary & all the followers! I hope this coming year is even better for you! I would pick either The Immortal Rules or Until I Die. Thanks for the awesome giveaway! Like the look of The Glimpse. Thanks for the giveaway :) so many great books... I think i'd like to won "This Is Not A Test"
These all look amazing, but I'd have to go with The Immortal Rules because I've heard the most about it. It's so hard to choose one. I think I'd have to pick, This Is Not A Test. I need a good zombie book to sink my teeth into. Breathe would be my #1 pick, it sounds amazing!! Thank you very, very much for this awesome giveaway!!! Wish you many years with books and this site! I'd like to win The Waiting Sky!